25 Minute Thai Pumpkin Pasta with the BEST lick-your plate sauce! Easy Pumpkin Pasta bursting multi-dimensional Thai flavors in a creamy, tantalizing spicy peanut pumpkin sauce that you will want to make year round! This Pumpkin Pasta can be on your table in 25 minutes! You can completely customize your Pumpkin Pasta recipe to include your favorite protein and whatever veggies you have on hand. 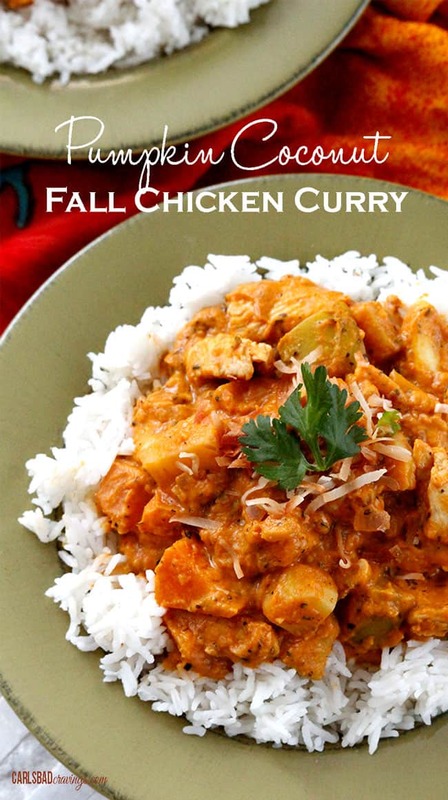 The sauce is mega creamy yet healthy at the same time and soooo lick-your-plate delicious! Have you heard there is going to be a pumpkin shortage this Fall? Pumpkin crops are down by about half this year so while stores will probably have enough canned pumpkin through New Year, they probably won’t be restocking after that any time soon. Sad, sad day. And especially sad if you don’t get your pumpkin fill ASAP! As in my Chocolate Chip Pumpkin Bundt Cake, Layered Pumpkin Cheesecake, Pumpkin Bars with Nutella Cream Cheese Frosting, Pumpkin Cookies,Pumpkin Muffins just to name a few… and now this 100% DELISH Spicy Thai Pumpkin Pasta. What to make first?! As you can tell, I LOVE everything Pumpkin but I also love everything pasta AND everything Thai – so what do you get when you add them all together?! Mind blowing Thai Pumpkin Pasta! 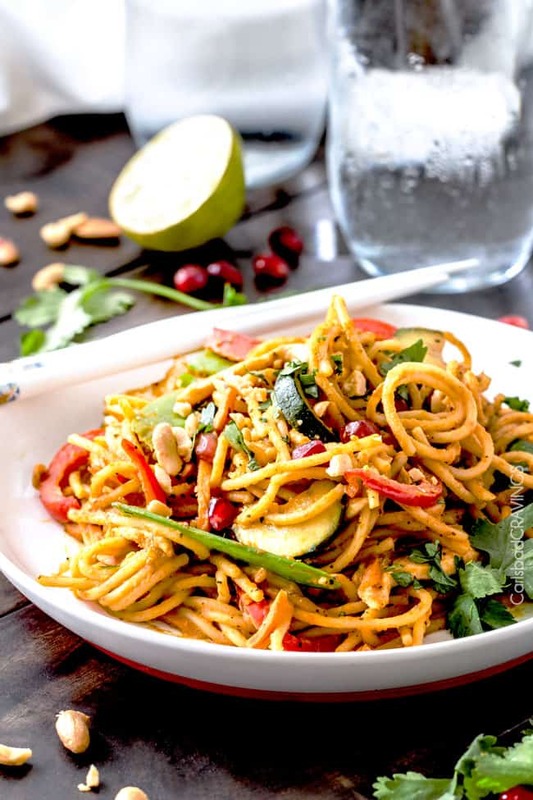 This spicy Thai Pumpkin Pasta is, in essence, your favorite peanut noodles with the added depth and creaminess from the pumpkin puree. 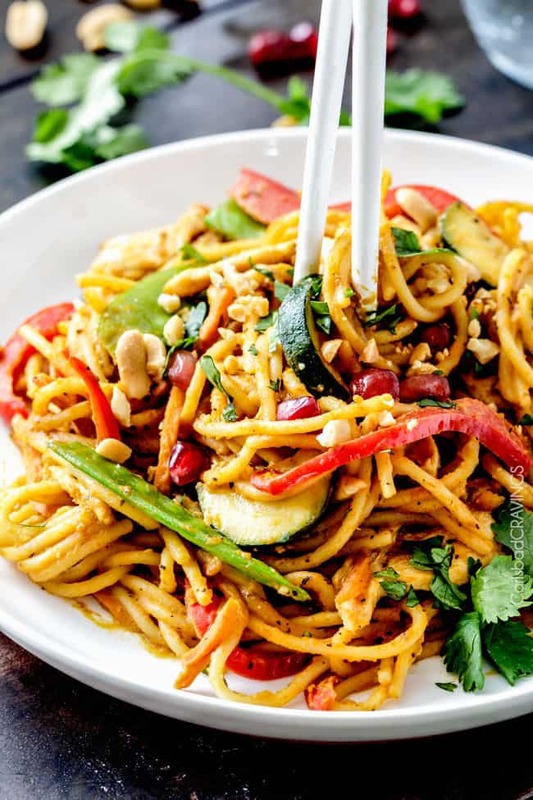 So basically, they are better than your favorite peanut noodles! 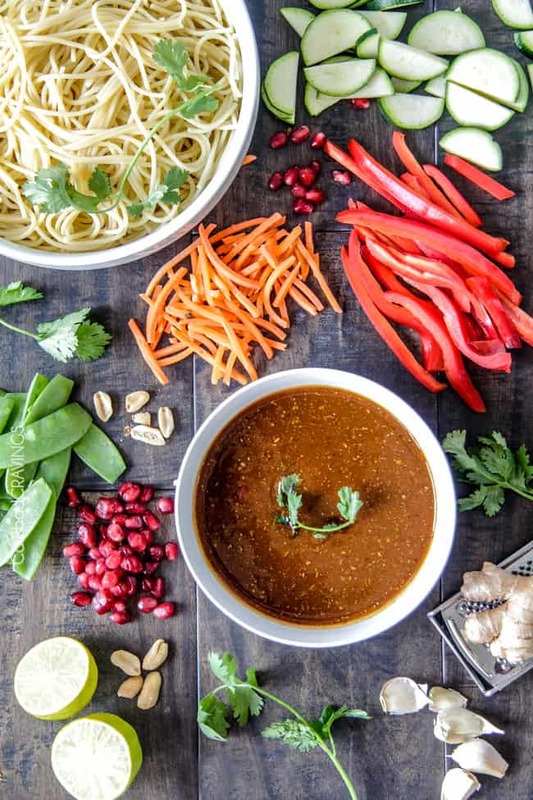 The healthy, flavor bursting velvety sauce of hearty pumpkin puree whisked with soy sauce, smooth peanut butter, lime juice, mirin, brown sugar, fresh basil and Sriracha is further enlivened by stir fried red curry, ginger and whatever crunch of vegetables you choose. To make this Pumpkin Pasta a complete meal-in-one, I added zucchini, carrots, red bell peppers and snow peas and threw in a few sweetly tart pomegranate seeds just for an extra oomph, but really, you can just add whatever you have in your fridge and it will taste AH-mazing because the sauce is AH-mazing. Stir fry pastas are all about the sauce. And if you are worried about this being too spicy, never fear, just add less Sriracha! You can always add more later, but you can’t take it back. Cook your pasta al dente – no one wants mushy Pumpkin Pasta! I rinse my pasta with cold water to keep it from cooking and toss it with a little olive oil to keep it from sticking. For maximum efficiency, use the time while the noodles are cooking to whisk together your Pumpkin Pasta Sauce ingredients. Use Pumpkin puree and NOT pumpkin pie filling. 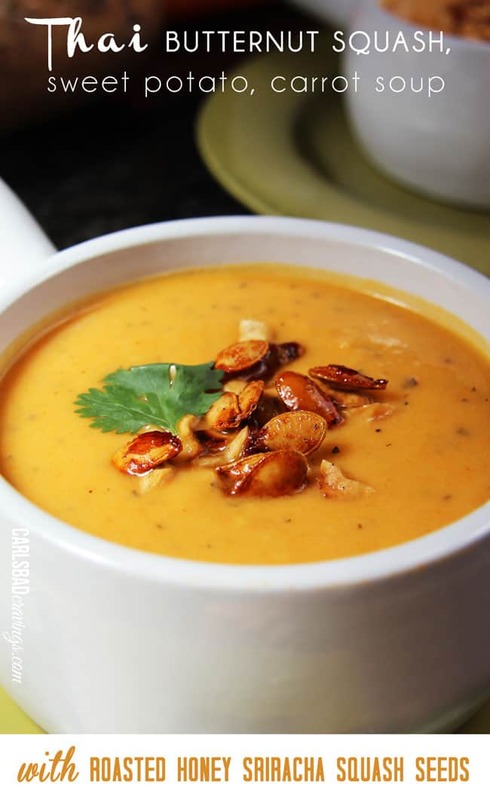 Pumpkin puree is 100% pure pumpkin that has been cooked and pureed. Pumpkin Pie filling, however, has been sweetened and seasoned with Fall spices. Have your Pumpkin Pasta Sauce ready and all your chicken and veggies chopped before you start cooking because the actual cooking process is super quick and you want everything ready to go at your fingertips. It is much easier to thinly slice your chicken when it is partially frozen, that way it is not squirming all underneath you. If you don’t like heat at all, start with 1 teaspoon Sriracha. I would say 2 teaspoons Sriracha is medium heat and 3 is on the spicy side. I would start with less if you aren’t sure because you can always add more heat at the end of cooking – but it is hard to take it away! Taste your Pumpkin Pasta at the end of cooking and add additional lime juice for tangier, sugar for sweeter, soy sauce for saltier. After you toss your Pumpkin Pasta in the sauce, you may wan to add additional water to thin to desired consistency. Garnish, garnish, garnish! 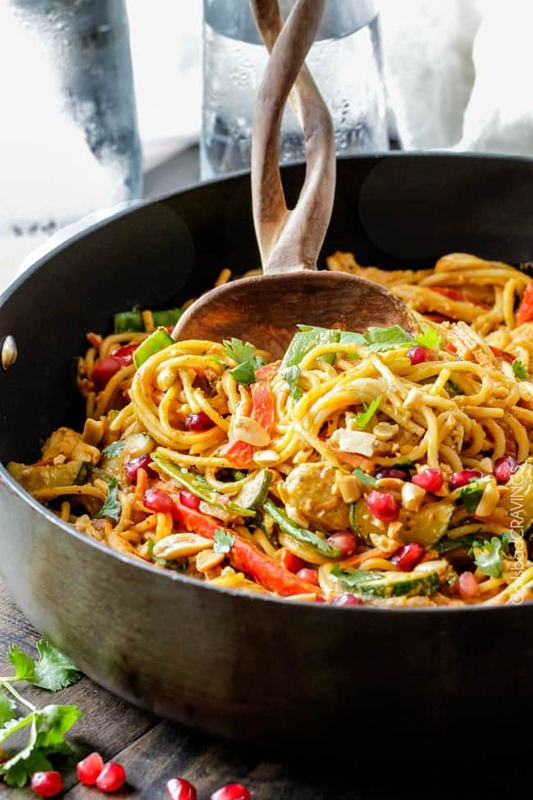 Crunchy peanuts, cilantro, and pomegranate arils make this Thai Pumpkin Pasta come alive! This Pumpkin Pasta is easy to customize to your own different preferences by adding different vegetables or proteins and making it tangier, sweeter or spicier. Veggies: As far as veggies go, I’ve zucchini, carrots, red bell peppers and snow peas but you can omit any of these veggies and substitute with your favs or make it a cleaen-out-the-fridge night. Proteins: You can omit the chicken altogether or substitute it for beef, shrimp or tofu. If substituting beef, then marinate it first in some soy sauce, brown sugar and rice wine vinegar and you can follow my cooking instructions in my Beef and Broccoli recipe. For shrimp, cook them as you would the chicken just until opaque, about 3 minutes. Remove to a plate per the chicken instructions. Tofu Option: For Pumpkin Pasta with tofu, use 4 ounces of extra-firm tofu, cut int 1/2 inch cubes and add them to the skillet with the noodles at the end of cooking. So between now and New Year and no-more-pumpkin puree – I hope you get your pumpkin fill and I hope it includes treating your taste buds to better-than-takeout 25 Minute Spicy Thai Pumpkin Pasta! 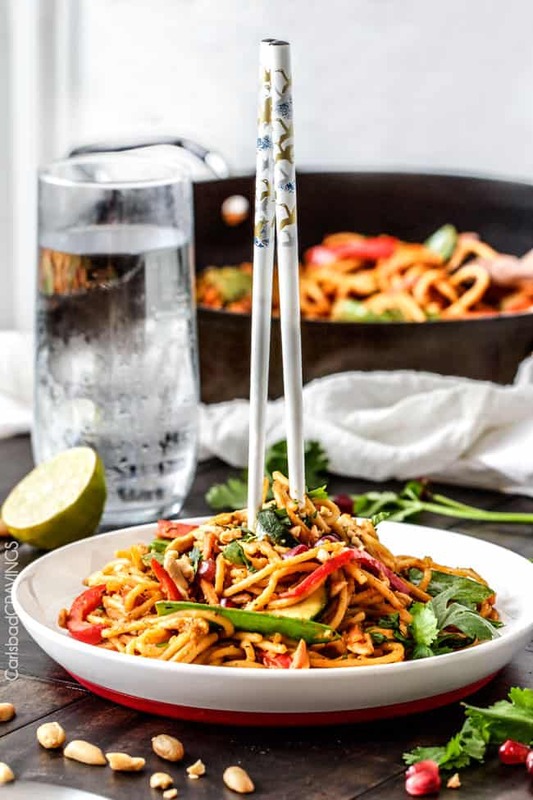 Looking for more Noodle Recipes? WANT TO TRY THIS PUMPKIN PASTA RECIPE? 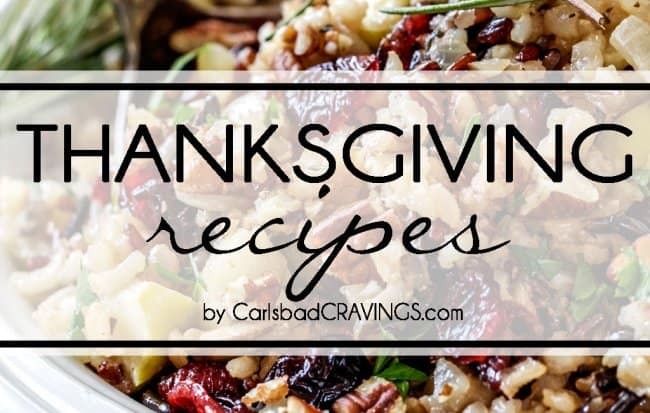 PIN IT TO YOUR PASTA, ASIAN, CHICKEN, DINNER OR 30 MINUTE MEALS BOARD TO SAVE FOR LATER! 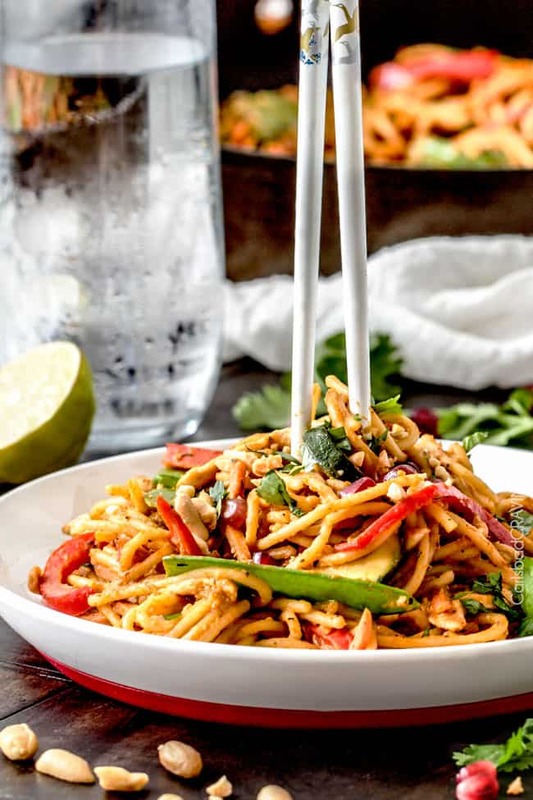 25 Minute Spicy Thai Pumpkin Noodles (with chicken option) are quick and easy to whip up and smothered in the most tantalizing spicy peanut pumpkin sauce that you will want to make year round! In a medium bowl, whisk together Spicy Pumpkin Sauce Ingredients. Set aside. Heat 1 tablespoon olive/coconut oil over high heat in a large nonstick skillet. Add chicken and stir fry for 1-2 minutes or until almost cooked through (it will finish cooking in sauce). Remove chicken to a separate plate. Heat an additional 2 tablespoons oil over medium high heat in the same pan. Add red curry, ginger and zucchini and stir fry for 2 minutes. Add bell pepper and carrots and stir fry 2 more minutes. Add garlic and saute 30 seconds. Add Thai Pumpkin Sauce, snow peas and chicken and simmer until slightly thickened and chicken is cooked through. Stir in peanut butter. Add noodles and toss until evenly coated, adding additional water if sauce has become to thick. Taste and add additional Sriracha if desired. Garnish with cilantro, lime juice, peanuts and pomegranate arils (optional). Cook your pasta al dente - no one wants mushy Pumpkin Pasta! I rinse my pasta with cold water to keep it from cooking and toss it with a little olive oil to keep it from sticking. **It is much easier to thinly slice your chicken when it is partially frozen, that way it is not squirming all underneath you. If you don’t like heat at all, start with 1 teaspoon Sriracha. I would say 2 teaspoons Sriracha is medium heat and 3 is on the spicy side. I would start with less if you aren't sure because you can always add more heat at the end of cooking - but it is hard to take it away! Perfect! 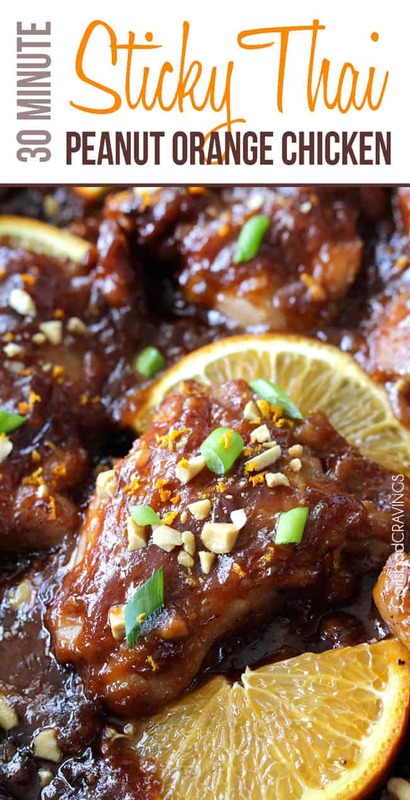 Then you can make this anytime you crave something creamy and spicy! 🙂 Thanks Dorothy! Your photos are stunning! That being said, I wasn’t too sure about the Pumpkin Sauce – but oh my goodness, this was amazing! Even my picky boyfriend liked it! Thank you! Thank you so much Kelsey – you are too nice! I am so glad you made this and both you and your boyfriend loved it – yay! Thank you! Hi Shania, I am so happy it was such a hit and for the 10/10 – yay! Thank you so much!!! I have a list of pumpkin recipes to make this fall and I knew I had to make this. It’s just as easy as promised. I used some extra pumpkin to finish off a can. I also used roasted cauliflower instead of chicken and added some fresh spinach. My red curry paste was unexpectedly spicy so the dish was hot. I would also scale back on the sugar if I make it again next year. I also used whole wheat pasta, which I thought added some nice texture. In all a nice weeknight dinner. Hi Rachel, I’m so happy you found it super easy and I love your additions of cauliflower and spinach yum! Thanks for taking the time to comment!